Veterinary medicine is becoming increasingly sophisticated and offers innovative and exciting ways to prolong and enhance the lives of companion animals. Medical procedures and surgeries, such as emergency and internal medicine, critical care, oncology, and orthopedic and soft-tissue surgery are on the rise. As a result of these advancements, the demand for canine blood transfusions has increased sharply. As such, canine blood donation has become more imperative and topical than ever. The development and maintenance of canine blood banks is a relatively new phenomenon, as are efforts to make blood products widely available to veterinarians. 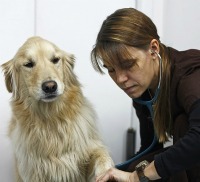 Before regional canine blood banks, veterinarians whose patients required blood had to rely on their own dogs or those of a colleague or client. While there are few national animal blood banks, the ever-increasing need for canine blood and blood products has resulted in several regional programs, including banks in Maryland, Florida, Michigan, Texas, Colorado, California, Georgia, and Pennsylvania. Canine blood banks, much like human blood banks, rely on the generous donations of volunteers who meet blood donation requirements. Some regional blood banks, such as California’s Hemopet, rely on resident canine donors that are housed in on-site kennels. Often, resident canine donors are retired racing Greyhounds and dogs from local shelters who would have otherwise been euthanized. Other regional blood banks, including the University of Pennsylvania’s Penn Animal Blood Bank (PABB), utilize their own Bloodmobiles, which are used for blood drives from veterinary hospitals and breed and other dog clubs. According to the National Canine Cancer Foundation, there are essentially two types of blood donation programs, “Full Pint,” and “Half Pint.” While dogs of various sizes and breeds can meet donor requirements, their weight determines which donation program they will be placed into once they meet the basic behavioral and health criteria required of all donors. All prospective canine donors must be calm, friendly, and obedient; donors should also be receptive to strangers, cooperative without their owner(s) present, and comfortable being handled physically and examined. Similar to their human counterparts, in order to be eligible to donate blood, dogs must be in general good health. To this end, donors must be current on their required vaccinations, including distemper, parvovirus, parainfluenza, hepatitis, and rabies; they must also be free of any medications other than flea, tick, and heartworm preventative. Dogs who have received blood transfusions and/or those with heart murmurs or other cardiac conditions are ineligible to donate blood. For female dogs, some programs include no history of pregnancy in their eligibility requirements. Age and weight requirements vary slightly from across programs, typically ranging from one to nine years of age and thirty-five to fifty pounds or more without being overweight. After meeting the basic requirements and before the donation process is underway, dogs are given a complete physical, blood chemistry profile and complete blood count. Prospective donors are also screened for other possible conditions like Brucellosis, Rocky Mountain Spotted Fever, and Lyme Disease. The procedure of canine blood donation is a fairly simple and straightforward process. Blood donation typically lasts between fifteen and thirty minutes. Dogs are gently placed on their sides atop comfortable bedding and soothed while the area on and around their jugular vein is cleaned and prepped. Once the area has been sterilized and, if necessary, clipped or shaved, blood is then drawn through a needle into a sterile collection set. After the blood has been collected, dogs are given belly rubs, and edible treats and/or IV fluids help hydrate and replace blood lost during the procedure; they also sometimes receive bandannas, ID tags, collars, or toys. Once the blood has been collected, it is spin-processed in a centrifuge and separated into components. White and red blood cells, platelets, and plasma comprise canine blood; the most common canine blood transfusions utilize red blood cells and plasma. Each blood component has its own unique healing properties. Red blood cell transfusions are useful when treating anemia, cancer-related blood loss, and to supplement the body’s waning production of red blood cells as a result of illness such as bone marrow disease. Plasma is rich in anti-coagulants and proteins. As a result, plasma transfusions are used to treat ailments such as internal bleeding, deadly canine diseases such as Parvo, inherited bleeding disorders, and hemophilia. Just as people have blood types, so too do dogs. Rather than blood “types,” however, canine blood varieties are commonly referred to as “groups.” Dogs have over a dozen different blood groups, six of which are fairly common. Both humans and dogs can be classified as universal donors based on their type or group. Roughly forty percent of dogs belong to the universal donor group. Blood from dogs belonging to the universal donor group is compatible with any prospective recipient’s blood. Because dogs, just like humans, can suffer adverse reactions to transfused blood from dogs with different types than their own, dogs with the universal blood group are ideal donors. The benefits owners receive from enrolling their pet(s) in blood donor programs far outweigh any disadvantages. Some canine donors, like humans, may experience soreness or minor swelling at the site, yet most can resume their normal routines within a day of donating. In addition to the personal satisfaction owners likely receive from knowing their dog’s blood donation will help save other dogs’ lives, owners often receive tangible benefits as well. Owners often save on preventative care or receive reimbursement toward future care; they also benefit from extensive blood screening and typing. These procedures are otherwise expensive and offer owners valuable medical information about their pets which could be useful or necessary in emergencies. Furthermore, many blood banks offer owners free food, veterinary services, and free lifetime blood transfusions for the donor and/or other pets in the donor’s household. While canine blood donor requirements vary across states and programs, the need is constant. Canine blood donation benefits both owners and canine recipients. If owners are interested in possibly enrolling their pet(s) in a blood donation program, they should contact their local veterinarian, veterinary school, or emergency veterinary clinic for more information. The AKC Canine Health Foundation does not endorse or have a relationship with any canine blood bank. This list is not comprehensive - please check your local area for additional blood banks.